If, after becoming a certified surgical technologist and working in the field for a period of time, you may want to advance in this allied health career. If this sounds like you, investigate becoming a Certified Surgical Assistant (CSA), or Certified Surgical First Assistant (CSFA). Surgical assistants are medical professionals who assist both surgeons and nurses during surgical and other medical procedures. Like surgical technologists, they have specific responsibilities in the operating room, plus pre- and post-surgery duties. A first assistant position is not an entry-level position. Because it is the next level up in skills and leadership, you must already work in the healthcare field as a surgical technologist, nurse or other health professional, preferably in a surgical capacity. The primary duty of surgical assistant is assisting surgeons. You’re under their supervision when performing all tasks. Collaborating with doctors, consultants and other surgical team members to ensure the proper post-operative care of patients. Positioning and prepping patients prior to surgery. Responsibilities of a surgical assistant can be broken down into four different areas which align with most surgical assistant education programs. Patient’s anatomical and physiological limits. Surgical procedure to be performed. Perform specific tasks utilizing appropriate techniques. Achieve hemostasis by means of injection. Aide in implanting, securing, and/or removal of devices and drains. Incision and layered closure of surgical sites. Manipulation and dissection/removal of tissues. Aid in transfer of the patient. Apply specific dressing material such as splints or casts. Follow patient to recovery as needed. The responsibilities of a surgical assistant help surgeons perform safe operations resulting in optimal results for the patient. Tasks are more expanded and elevated than those of a surgical technologist. The pressure is also higher, so when considering this professional career, you will have to decide if you want to deal with this type of stress on a daily basis. The work of a surgical assistant is every bit as physically demanding as that of a surgical technologist. You’re on your feet most of the day, and are expected to stand throughout all procedures regardless of length. You must always be attentive, anticipating what tools the surgeon may need and respond quickly when she or he asks for them. Like surgical technologists, surgical assistants wear scrubs to minimize the possibility of infection to the patient. And similar to all members of a surgical care team, jewelry and long nails (even artificial nails) are almost always prohibited. As a surgical assistant, if you have an entrepreneurial nature, you may decide to be self-employed. You can also work in hospital surgical units, surgery centers or private surgical medical practices. If you enjoy teaching others about the profession, you can also become an academic instructor. Almost all surgical assistants are hired as full-time employees. Hours and weeks are long depending upon the number of surgeries scheduled in any given day or week. If you go into this career field, expect early morning hours, being called in to assist with emergency surgeries, and working on holidays and weekends. In all cases, to become a surgical assistant you’ll need to graduate from an accredited surgical first assistant program. 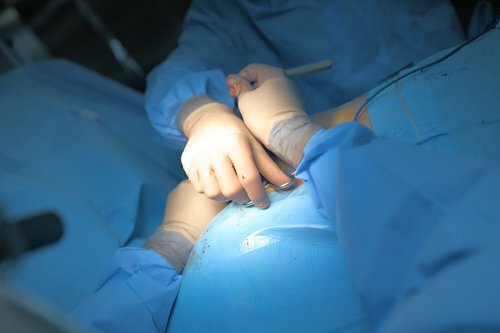 In most cases, in order to enter a surgical first assistant program, you must first have an associate degree in surgical technology from an approved, accredited surgical technology program. You must also have successfully passed your Certified Surgical Technologist (CST) exam conducted by the National Board of Surgical Technology and Surgical Assisting (NBSTSA). Several years of experience in operating room assisting (often must be completed within the last 3-5 years). Proof of a current CPR certification for healthcare providers. Certain course work such as physiology, microbiology and/or medical terminology (taken within the last 7 years). Check the admissions guidelines of the surgical assistant program you are interested in. Once you find the right educational program for you, it can be completed in as little as 12 months. The overall objective of most surgical assistant programs is ensuring students can perform surgical assistant skills with proficiency. The curriculum provides students with the experiences necessary to document 135 or more procedures, all designed to verify competencies required of the position. Specific program objectives will meet standards established by the various approval and accrediting organizations. To provide a competency-based environment where students can apply their advanced knowledge of normal and pathological surgical anatomy and physiology. To deliver a training program in various settings where students can demonstrate preoperative, intraoperative and postoperative skills. To offer students opportunities to acquire and practice professional behavior in working relationships with patients and members of a surgical care team. To ensure students are able to communicate patient needs and surgeon preferences to all members of a surgical care team. To facilitate the professional leadership growth of students through knowledge of the role and how it pertains to ethical, moral and legal responsibilities. Surgical assistant programs are carefully sequenced between clinical experiences, and classroom theory. Although you will have assisted in many procedures as part of your surgical technology degree and experiences, the clinical cases in a surgical assistant program involve utilizing more skills. The variety and intensity will be different than what you’re used to. The concentration curriculum of most surgical assistant programs is comprised of advanced courses in surgical technology. Although you may have taken similar courses in your associate degree program, surgical assistant courses go into much more detail. If you are interested in earning an a degree or certificate in surgical assisting and then taking the CSFA exam, a list of approved education programs can be found at the Commission on Accreditation of Allied Health Education Programs (CAAHEP). If you want to take the CSA exam, you can be a graduate of a surgical assistant program approved and accredited by either CAAHEP, or ABHES, the Accrediting Bureau of Health Education Schools as long as the program has completed the National Commission for the Certification of Surgical Assistants (NCCSA) approval process. Graduates of a surgical assistant program can then become Certified Surgical First Assistants (CSFAs) or Certified Surgical Assistants (CSAs). Each credential is offered by a different organization and has different eligibility requirements. Both of these exams are standardized tests that prove you possess the appropriate level of education, experience and skills to be a trusted surgical assistant. Passing one is required in order to work as a surgical assistant. The CSFA exam is administered by the National Board of Surgical Technology and Surgical Assisting (NBSTSA). Currently the test is composed of nine graded, multiple-choice questions and you must correctly answer a specific number of them to pass. All applicants for the exam must be graduates from a CAAHEP-accredited training program. In the alternative, with documentation of appropriate work experience, continuing education and certification, this requirement may be waived. • 200 cases (75 general surgery; 75 in one specialty area; 50 in any other specialty area(s)) conducted within 2 years prior to application date. Once your application is approved, NBSTSA sends you an Authorization to Test number (ATT) and a phone number/web address for an approved testing agency. You will schedule your exam with that agency. The entire process takes 4-6 weeks to complete. Remember, if the surgical assistant program you are considering is not CAAHEP-accredited, obtaining the CFSA credential may prove difficult. The CFSA is the credential most employers look for. The CSA credential is administered by the National Commission for the Certification of Surgical Assistants (NCCSA). Currently this exam consists of nine sections. You must correctly answer a percentage of them in order to pass. All applicants for the exam must be graduates from a NCCSA-approved training program which is accredited by either CAAHEP or the Accrediting Bureau of Health Education Schools (ABHES). With appropriate documentation, there are some alternatives to this, such as military training, that may be used in lieu of this requirement. Check the NCCSA website for the specific documents you may need you’ll need for your status. Once your application is approved, within 48 hours you will receive a phone call to schedule your testing date. Like with most professions in allied health, surgical assistants are required to take additional courses once they are certified. Depending upon the type of certification you have, the renewal criteria is different. Every four years, the NBSTSA requires 75 credits of continuing education for CFSA renewal. Proof of these 75 credits is submitted with your renewal application. If you happen to hold both a CST and a CSFA, when you complete 75 credits, both credentials can be renewed. Details, steps for renewal, and updates are always located on the NBSTSA site. If you possess a CSA, you are required to complete 50 CSA credits within your two-year certification period. Details, steps for renewal, and updates are located on their website. Regardless which certification you opt for, following the eligibility requirements exactly is important or there will be delays in obtaining your certification or renewal. Without it, you may be unable to practice in the field. In the case of renewal, if you allow your certification to lapse, you may be suspended from practice until your renewal is taken care of. Take your first-time certification exam as soon as possible after graduation. Bear in mind that while your education is extensive, it will not be enough to pass the test. Purchasing a study guide or registering to take a qualified review course immediately prior to the exam will improve your chances of passing the test. Apply for renewal two to three months prior to the expiration of your current certification. Be sure you have participated in continuing education credits throughout the period of your certification. You will be unable to secure all the necessary hours in a short period of time. When sending in your documentation, always keep copies. Fees for certification and renewal range from $100 to $700. If you are a member of a surgical technology support association (ASA or NSAA), fees for these tests are normally reduced. The CSFA test recognizes membership in the Association of Surgical Assistants (ASA). The CSA test recognizes membership in the National Surgical Assistant Association (NSAA). Proof of your membership is required. More information on these two organizations is located at the end of this article. The Bureau of Labor Statistics (BLS) indicates the demand for surgical assistants will rise 12% through 2026. People are healthier than ever before, and they are living longer. However, 60% of the senior American population suffer, on average, from at least two chronic illnesses. So the demand for all healthcare professionals is high. For more statistics and estimates of annual salaries, you can visit the BLS. Ability to correctly respond to orders – You have to cheerfully follow orders precisely and immediately. Effective communication skills – You must be able to communicate all types of information to patients and members of a surgical care team. Handling high-pressure situations – Due to the intensity levels in an operating room, you must be able to react intuitively in short time frames. High attention to detail with a long attention-span – Attentiveness to anything abnormal in a patient’s vital signs is essential. Personal fitness – You have to lift and reposition patients, so a certain level of fitness is beneficial. Self-confidence – Pre- and post-surgery procedures are frequently performed alone, so you have to possess enough confidence to do them and know you’re doing them correctly. Strong hand-eye coordination and dexterity – Surgical work involves both large and small surgical procedures. A surgical assistant must be able to assist with both. Wide range of personal and professional skills – This encompasses technical skills inside the operating room and leadership skills outside of it. Working both independently and in a team environment – You must be comfortable working with peers as well as people in positions of authority. Outside of the OR, you will be expected to work on your own when following up with patients. Many surgical assistant programs provide some robotic surgical procedure training. The workplace may expose you to others. Opportunities to remain current with the most recent advances that minimize risk to patients and speed up recovery time can be exciting. Although you acquire a lot of education when becoming a first assistant, you’ll learn even more from members of your surgical team. The more you know, the more valuable you are. Working in an operating room is demanding. Team members of a surgical care unit are no less so. Collaborative team membership adds to your leadership and technical skills. As a surgical assistant, or even a surgical assistant student, you can join the Association of Surgical Assistants (ASA). This organization supports people in the profession, and those aspiring to the career. It works toward ensuring optimal surgical patient care. It also promotes the recognition of surgical assistants and offers continuing education opportunities. You may elect to become a member of the National Surgical Assistant Association (NSAA) on their site. They promote excellence in the field, offer educational opportunities and professional certification, and encourage the recognition of surgical assistants. Even if you are still in high school, if you are interested in the field of surgical assisting, you can begin today by acquiring a suturing kit. The Apprentice Doctor offers these kits, complete with instructional videos. You can practice suturing, tying knots and other skills common in the field. As you’ve learned, you need a lot of self-confidence as a surgical assistant. With a suturing kit, you can begin growing that confidence as you gain agility in performing critical suturing tasks. After completing this internationally accredited program, you’ll possess advanced skills and knowledge in the field. For more information on the first step in becoming a surgical assistant, read our previous article on – Becoming a Certified Surgical Technologist. And read an interview with a practicing surgical technologist.